If you open up the stock camera on the developer beta of iOS 11 and point it at a standard QR code, you’ll get a pop-up prompt with the decoded text or action. You can turn off the feature if it bothers you, but I say hooray. 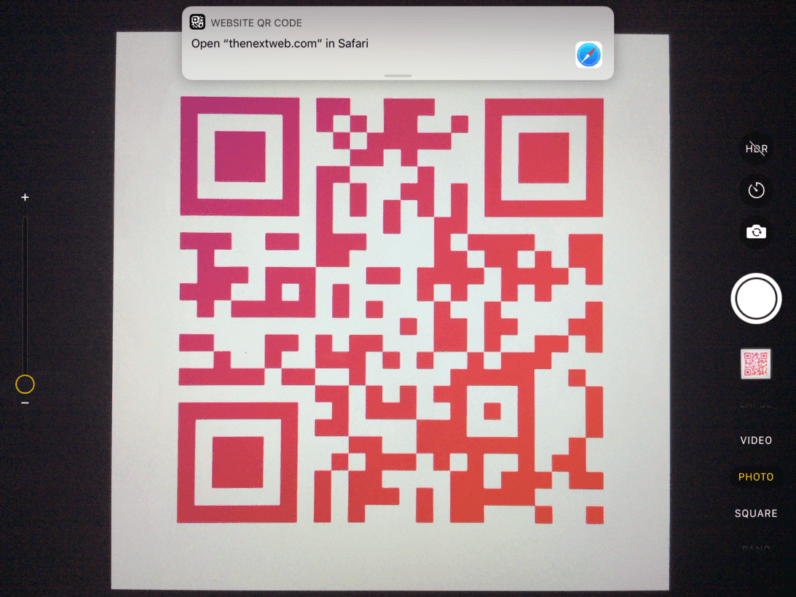 It’s dead simple, and will make QR codes much more accessible for anyone with an iOS device. Of course, QR codes aren’t anything new. They’ve been around since 1994 and became more prominent with the advent of the smartphone, but never quite as popular as you’d imagine. Snapchat and Facebook have started using their own variants to make it easy to add friends, but QR codes remain fairly niche tools on the whole. That’s a bit of a shame. QR codes can make accessing and sharing useful data – like contact information, URLs, addresses, phone numbers, etc – incredibly fast and easy. In theory, it should be even faster than typing a query into Google, summoning Siri, or asking your friend. You can always disable the feature too. There’s just always been one problem: you have to install a separate app to scan them. Considering speed is the whole point of using QR codes in the first place, having to go out of your way to download a scanning app is enough of a deterrent to ignore them altogether. Even if I already have an app installed, I’d much rather use the default camera anyway. As you might imagine, Apple isn’t the first to come up with the idea. You can do the same with Samsung’s camera on the Galaxy S8, for instance, but you have to activate the Bixby vision feature first. I’m not sure most people even know what a QR code is, so that small extra step is basically enough to ensure only a handful of people will ever use it. Indeed, the only way QR codes could possibly be widespread and useful is if there’s no barrier at all. Users need to be able to discover the feature on their own, and it needs to be seamless. With iOS 11 if someone tries to take a an advertisement, invitation, business card or other item that happens to have a QR code on it, they can access the information a lot more quickly. That’s pretty neat. With Apple natively scanning QR codes now, I expect Android devices will soon follow suit. Like them or not, expect QR codes to make a bit of a comeback in the next year or two.